It's been about a month since my last update about the development up on the mesa. They have been working diligently M-Th blasting and moving dirt with Fr and Sa devoted to drilling blast holes or laying sewer pipe and water lines. I just missed another blast last Wed as I was taking Mesa for walkies. I was about half way up the hill when I heard a horn blast. A few seconds later I heard a deep *thump*. By the time I got to the top all I saw was a massive dust cloud blowing north in the wind. Here's the latest progress map. Blue are pre-existing roads. Red are roads that had been blasted previously, and green are the roads that have been blasted since the last post. 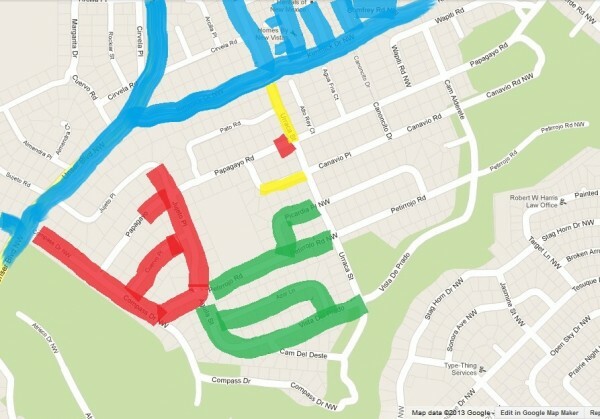 The yellow are roads which have been trenched. I was wondering why they put in a water line with a fire hydrant into the middle of nowhere, but then I discovered the method to their madness. They activated the line and are now using the water from the hydrant for dust control. The rockpile of excavated material has grown considerably and is probably now 30'+ high. I have also noted that on some roads they have blasted they have simply removed the sand and rock and filled it back in with more uniform-sized sand. I guess they will bring in a shovel at a later time to re-excavate the trench to install the pipes.